As I am compulsively refreshing the CNN homepage like I do every day, I suddenly notice there’s a new icon next to some headlines in the “Latest News” section (it’s the one to the right of the headline).It looks like the letter T but upon closer inspection more like a T Shirt. Why would a T Shirt icon sit next to selective headlines at cnn.com? For CNN headline shirts of course! At that point I distinctly remember hearing the exclamation “Brilliant!” from that Guinness commercial. I mean seriously CNN headline T Shirts? Who would want to wear that? The next is “Principal sets up drug sting on student”… WTF! So now here I am, obsessively refreshing the T shirt’s homepage to see how low this can possibly go. Nothing too appalling so far, but on the other hand nothing I would even remotely consider wearing. Frequently Asked Questions about CNN Shirts.Thank you for your interest in CNN Shirts. With CNN Shirts you can wear the news. If you have any issues or questions regarding CNN Shirts please read the answers to the frequently asked questions below. How long are headlines available for? Headlines that can bought as shirts are only available as long as the headline stays in the latest news section. How can I share my shirts on Facebook? When you purchase shirts from the CNN Shirt store you will see “Share on Facebook” links that accompany all purchased headlines in your receipt page. When you click the share button the headline you purchased shows up in your news and mini feed. What kind of shirts are headlines printed on? CNN Shirt uses high quality American Apparel t-shirts. Please visit americanapparel.net for more information. Currently CNN Shirts come in gray, white, or black. What is the little timestamp on my shirt? The little timestamp on your shirt is denotes the date and time your headline was created. I took my CNN shirt on vacation and I have great pictures. Where can I send them? 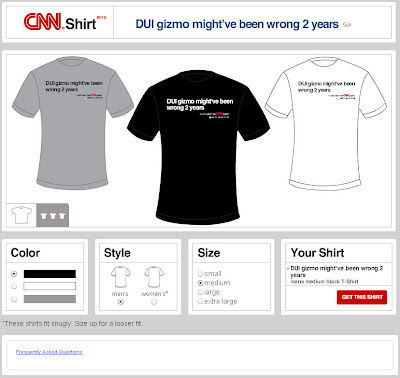 Please upload any photos of you wearing a CNN Shirt to www.ireport.com/tshirt. Your photo will be considered for future contests, and our CNN Shirt photo archive. My CNN Shirt has not arrived yet. Who can I talk to? Please take up any billing or shipping inquiries with Spreadshirt, our vendor partner. Please use their provided contact form and be sure to include your order confirmation number. If you have a coupon for CNN Shirts, redeem it for discounts and free shirts at the CNN Shirt store. Pick a headline that you want to purchase from CNN.com, customize it and proceed to checkout. In the checkout phase there is a coupon code field that you can enter your code into. Your coupon code is printed on your discount card, or in your discount email. Please remember that all codes expire on 12/31/08 at 12:00 am EST. 2. We will get a T Shirt along the lines of “20 bodies found floating near Bahamas” and then CNN will shut down the service.